In the garden Eleonore reclines on the step of the marble fountain, her lazy hand skimming the surface of the water, like a cat batting at a goldfish. Her eyes are on me. It is as though she thinks I am the fish or the mouse or the bird or whatever small creature she wishes to toy with. But I am not like her other admirers. I am weak in only one regard: that I am passionately in love with her. I place the golden box on her lap. To her credit, her eyes do not flit away but continue to linger on my face. They twinkle, blue as violets. Sometimes I fancy Eleonore loves me, though it cannot be the constant ache I feel for her. She is the other half of my soul. I want to be forever near her, mine alone. She lifts the lid. She smiles. Rows of diamonds drip from a chain, glittering in the afternoon sunlight. The necklace is extravagant. Desire glistens in Eleonore’s eyes. She touches the center jewel. She lifts up her black curls, leaving her bare neck exposed. I pluck the necklace from the box, trying to hide the tremble of my hands. I am close now, so close to that slender throat. My fingers graze the surface of her skin. The necklace loops, the ends meet. My heart races as I snap the clasp shut. It is done. My Eleonore belongs to me. She admires her reflection in the water. “Beautiful,” she repeats. She does not gasp, nor bring a hand to her heart. The blood does not leave her cheek. She must not know that the Necklace of DuChelle is an enchanted object, which binds to the wearer’s throat and cannot be removed. Whosoever puts the necklace on shall be the master, and if the wearer betrays the master, the necklace will tighten and strangle the wearer to death. I love Eleonore with all my heart. I cannot tolerate the thought of another man stroking her face, stealing kisses from her lips, carrying her off to bed. Yet I know too the kind of woman she is. Without a reminder, she will fall to temptation. Now she turns to me. She loops her arms around my neck and kisses me. I kiss her back, fiercely, freely. I am secure. She will not betray me. Not now. Not ever. Eleanore pulls back. A low laugh bubbles in her throat. Not a laugh I enjoy—it is the sound of her carrying out a triumphant prank. The necklace drops clattering onto the marble fountain. I utter a cry. Eleonore sweeps it into the water like a withered flower. She stands straight now, facing me, her slim shoulders erect, her chin lifted high. My hand leaps for my throat. Yes, there is a chain. She must have slipped it on while we kissed. I grasp the necklace. It is as light as a piece of thread. I yank. I am not a man of little strength, but pull as I may, the chain does not rip. It wraps my neck like a serpent. I stare at her. Even now, she is beautiful. Even now, I desire her. This betrayal only makes me love her more, yet suspicion spreads thick over my heart. “How did you obtain the Necklace of DuChelle?” I ask. “A lover of yours?” My heart pulses. My body flashes red. I will not have it. She may laugh at me all she wishes, but she will not laugh with them, she will not confide to other lovers and stare at them with naked desire, while I sit idly by, meek and tame. Never! For she is my soul split in two, and I will have her to myself, in this world or the next. Eleonore’s laughter stops as my hands wrap her neck. The necklace pinches my throat even as I squeeze hers. This story was an experiment that went terribly right. As a writer, brevity is not my strong suit (my first novel, The Changelings, clocks in at 600 pages), so when I discovered something called flash fiction--super short stories of 1500 words or less--I was curious to see if I could write one. I’d started keeping an idea journal to boost my creativity only a few days earlier, and one of the ideas I’d come up with was a magic strangling necklace. Flash fiction seemed like the perfect fit for it. I wrote “The Necklace of DuChelle” in a couple of hours and was surprised how much plot twists and irony I could jam into such a brief format. 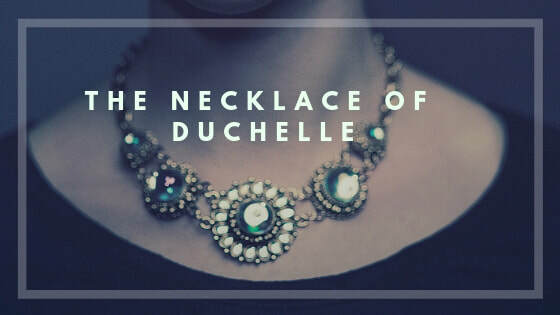 “The Necklace of DuChelle is my first flash fiction, and one I’m most proud of.